A little bit cloudy and rainy, but still really warm and humid. This top is another one I haven't worn in a while. It's an oldie that used to be in high rotation before the blog, but I started wearing it less often. Took me a while to find it in my blog archives too. I really like the lace detail on the neckline, I need to wear it more often. Not having much luck with reducing the size of my wardrobe lately - every old item I find and give one last wear to make a stay or go decision I seem to be keeping! At least I'm managing to slow my purchasing. Linking up with Friday's Fancies, What I Wore to Work, Casual Friday linkup, Friday's Fab Favourites today. Last worn: round neck top, lace pencil skirt, two tone flats, Marc by Marc Jacobs Hillier Hobo. Rebecca Minkoff have a "holiday hook-ups special" on at the moment, every day there is a new sale or discount. Today's deal is up to 65% off selected small leather goods. No code needed! 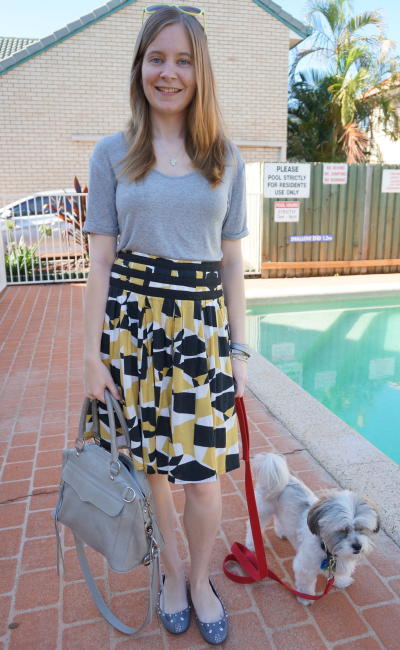 Last worn: yellow sunnies, Asos grey tee, printed skirt, studded mouse flats, Rebecca Minkoff mini MAB. Both the skirts are soo pretty!! Love the lace one the most Mica. So J that its summer for you..I am Michelin man here, almost everyday! Ugh.. Have a good weekend..
wait, I love that second skirt! that's exactly the shape I'd go for - I wonder if I can find the brand in the States (or online)? So cute! I love that skirt. Have a great weekend, if you get a chance Id love for you to stop by and enter a giveaway Im hosting! That lace skirt is so pretty, I love it. And the mouse flats are adorable. hehe, yes I'm trying very hard to have a slow and steady pace, as having a big clear out session definitely doesn't work for me. Having a designated "donate" bag helps, as when I come across something I just don't like for whatever reason, it can go there rather than back in my wardrobe. You seriously have the greatest bag collection, ever!! very cute look! I really love the two skirts! I love your lace skirt. I always love anything lace you wear! :) One of the problems I share with you is having issue of getting rid of old clothing items in my wardrobe. Recently I decided to just do it. I gave some of them to my little cousins (had to ship them parcels all the way to Cananda), and that's with the good quality clothings. I donated some of the really old ones AND managed to sell a pair of booties that I no longer wear (instead of donating I got a WHOLE $7 for them HAHA). I need both of your skirts, Mica! Please? Pretty please? Have a lovely break too. The weathers been crap lately, hey? Your dog is so cute and yay for christmas holidays!! Ah I love the print on the skirt you wore today. And always with your pup so cute. It is beautiful. I especially love it with the slouchy gray tee- perfect! I love your bag. Gray is such a great neutral and you can wear it with so many other great colors. This is such a beautiful color palette that you are wearing. I have a black lace skirt very similar! absolutely love it. Oh, that lace skirt is lovely!! Thanks! I don't mind the longer length, very demure for work :) It does look best with heels though. That lace skirt is AMAZING! You look fabulous! How gorgeous are both skirts! The second one is my favorite! Another two super styllish outfits. I really like both of them. I wish I had a Christmas break. Then again I cannot complaint as work has been kinda slow.